Corresponding authors. E-mail addresses: wangfeng62@126.com (F. Wang), awangjd@126.com (J. Wang). Abstract: In the present work, the sulfur doped bismuth-based catalysts were prepared by incipient wetness impregnation method and used for the hydrochlorination of acetylene to vinyl chloride monomer (VCM) in a fixed-bed reactor. The effect of introduction of S was characterized by N2 adsorption-desorption, powder X-ray diffraction, transmission electron microscopy, thermogravimetric analysis, temperature-programmed reduction and X-ray photoelectron spectroscopy. The characterization results indicated that the doping of S resulted in the increase of Brunauer-Emmett-Teller (BET) surface areas and decrease of active species particle size for the Bi-based catalysts, which led to more accessible active sites, and consequently boosted the catalytic hydrochlorination activity. The effect of H2SO4 concentration on the activity of this type catalyst was examined, and the results showed that there is an optimal loading of H2SO4 (S/Bi=0.5 mol/mol), at which the conversion of C2H2 was enhanced to 81% under the reaction condition and coke deposition is a main reason for the deactivation of catalyst. The acetylene hydrochlorination reaction is the main technology to produce vinyl chloride monomer (VCM) for the production of polyvinyl chloride (PVC) in the country with large reserves of coal, especially in China . In the typical industrial process, VCM is directly synthesized by reacting acetylene with anhydrous hydrogen chloride under the catalyzation of activated carbonsupported mercuric chloride (HgCl2/C) as catalyst. However, the volatilization of mercuric chloride during the reaction time will both cause the environmental pollution and the deactivation of catalyst [2, 3]. Also, resource shortage of mercury is another problem that the HgCl2/C catalyst encountered. Taking into account concerns regarding resources and the environment, strategies that catalyze the reaction with non-mercury catalyst derived from noble metal, non-noble metal, or metal-free material for the production of VCM are getting more concerns [4, 5]. Recently, most reported studies of the catalysts for acetylene hydrochlorination reaction have focused on non-mercuric noble metallic catalysts, like Au [4-7], Pd , Pt , Ru [10, 11], following the pioneer research of Hutchings and co-workers  on Au catalysts, which display excellent catalytic activity for the reaction. Yet, the noble metal catalysts have some disadvantages, such as cost, reduction and lose of active component and recycling of noble metal [12, 13]. Considering these shortcomings of the noble metallic catalyst, the non-precious metal catalyst is considered as a promising substitute for the non-mercury catalyst of acetylene hydrochlorination [12, 14]. Bi-based catalyst has been proved to exhibit better catalytic performance for the acetylene hydrochlorination and regard as a potential alternative to HgCl2 catalyst. In previous work, Wei et al. reported a Bi-Cu-H3PO4/SiO2 bimetallic catalyst with 30% of the activity of HgCl2/C and operated the catalyst in a 20 ton per year continuous fluidized bed reactor over 700 h. Also, many literatures demonstrated that bismuth can act as promoter for the Au-based catalyst [13, 16]. However, the presented Bi-based catalyst is still unstable and easily deactivated with the reaction time due to the Bi loss and surface carbon deposition. To develop more active, stable and easiness to obtain catalysts for acetylene hydrochlorination reaction, we attempted to modify Bi-based catalyst which has been little investigated in literatures before. It is known that enhancing the metal dispersion and specific surface area can improve the performance of catalysts for the acetylene hydrochlorination reaction [5, 13, 17]. Herein, a series of S-modified carbon supported bismuth catalysts were prepared using sulfuric acid as the sulfur source. The catalytic activity and stability of S-doped catalysts for acetylene hydrochlorination were investigated. Moreover, the correlation between the catalytic performance of the S-modified Bi-based catalysts and physical properties was deeply discussed and recognized. Performances of catalysts were carried out in a fixed bed reactor equipped with quartz tube microreactor (i.d., 10 mm), operating at a pressure of 0.1 MPa and a temperature of 160 ℃. N2 flow (20mL/min) via calibrated mass flow controllers was used to remove moisture and air in the system firstly, and then hydrochloride at a flow rate of 15 mL/min passed through the heated quartz tube reactor to active the catalyst. After the reactor was heated to target temperature, a flow rate maintain a volume ratio HCl:C2H2 of 1.25:1 and a total gas hourly space velocity (GHSV) of 120 h-1 was fed into. The products from the reactor was absorbed with sodium hydroxide solution and then analyzed by gas chromatograph. Fig. 1 displays the acetylene conversion of BiS0.1/AC, BiS0.5/AC, BiS1/AC, and BiS3/AC catalysts along with reaction time, respectively. BiS0.5/AC catalyst shows the superior catalytic performance for acetylene hydrochlorination among the four catalysts. For the catalyst BiS0.5/AC, the acetylene conversion decreases from 81% to 65% after 10 h running, the selectivity to VCM is maintained about 90% during reaction time as Fig. S1a (Supporting information) shown, indicating the optimal catalytic performance among the catalysts investigated in this paper. Fig. 1. Conversion of acetylene to VCM in acetylene hydrochlorination over BiSX/ AC. Reaction conditions: Temperature (T) = 160 ℃, GHSV = 120 h-1, feed volume ratio vHCl/vC2H2 = 1.25/1. Fig. S1b (Supporting information) compares the acetylene conversion of AC, S0.5/AC, Bi/AC and BiS0.5/AC catalysts. Through the results, we found that S0.5/AC even shows worse catalytic activity than the AC for the reaction, demonstrate that the individual existence of sulfur species in the catalyst is toxic for the acetylene hydrochlorination reaction, this may be due to the chemical dehydration effect of H2SO4. However, when the sulfur was added as SO42- to the Bi/AC catalyst, the obtained BiS0.5/AC catalyst displays elevated stability, its acetylene conversion reaches 81% after 100 min running. The acetylene conversion of Bi/AC catalyst declines from 69% down to 48% after running for 10 h, indicating that Bi/AC catalyst is heavily deactivated under the reaction conditions. This finding also proves that sulfur cannot directly provide catalytic performance for acetylene hydrochlorination reaction, commonly, but it will play a role in increasing the dispersity and stability of BiOCl component as a promoter. The X-ray diffraction (XRD) patterns of fresh and used of Bi/AC and BiS0.5/AC catalysts were shown in Fig. 2a. For Bi/AC catalyst, the peaks at 12.0°, 25.9°, 32.6°, 33.5°, 40.9°, 46.7°, 54.2° and 58.7° are assigned to tetragonal matlockite BiOCl (PDF card No. 06-0249) [18, 19]. When 2θ = 26.6°, it is the (002) plane of graphite carbon. XRD results in Fig. S2 (Supporting information) showed that pure BiOCl structure was detected when the addition amount of H2SO4 no more than S/Bi = 1, indicating BiOCl crystal particles are the main active components in the BiSX/AC catalyst. S-doped species may also present in the catalyst in small clusters and make contribute to catalyze the reaction. For modified BiS0.5/AC catalysts, the full width at half maximum (FWHM) of the peak at 25.9° increased, indicating the reduction of the crystallite size. The obviously less intense BiOCl reflections for both Bi/AC and BiS0.5/AC used compared to their corresponding fresh analogues could be due to the loss of Bi active components and carbon deposits on the surface of the catalysts. Fig. 2. (a) XRD patterns of fresh and used Bi/AC and BiS0.5/AC catalysts, TEM images of the fresh Bi/AC (b) and BiS0.5/AC (c), (d) H2-TPR profiles of fresh Bi/AC and BiSX/AC catalysts. Figs. 2b and c show two typical transmission electron microscopy (TEM) images. The large amount of black dots represents the metal particles. The dominant size of obtained BiOCl particle is about 38 nm in the fresh Bi/AC samples though some are found up to 50 nm in diameter. In contrast, particles around 33 nm are dominant in BiS0.5/AC. Catalyst Bi/AC in particular showed a large particle size distribution. Most of the particles in BiS0.5/AC had particle sizes between 23 nm and 40 nm, with a small fraction over 40 nm. The average particle size for Bi/AC was 37 nm and for BiS0.5/AC 35 nm. This demonstrates that adding sulfur species had caused a reduction in BiOCl particle size. Fig. S3 (Supporting information) displays HR-TEM images of the fresh Bi/AC and BiS0.5/AC, the resolved lattice spacing of 0.344 nm, which corresponds to (101) plane of tetragonal structure of BiOCl. The results of H2-temperature programed reduction (H2-TPR) analyses for fresh catalysts are shown in Fig. 2d. For the Bi/AC sample, there exhibits a characteristic reduction peak start at about 280 ℃ with the center at 438 ℃, also there was another peak at 541 ℃ observed. It is reasonable to propose that the first peak at lower temperature owing to the reduction of BiOCl species, the second peak thought to be the reduction of carbon functional groups , such as carboxyl, phenol, ether, and lactone groups on the active carbon surface. In our paper, the presence of BiOCl was well-demonstrated by means of XRD and HR-TEM results. For the modified catalyst, the reduction peaks of the first peak shifted to lower temperatures regions, the possible reason is that, on one hand, BiOCl active component with higher dispersion and smaller particle size were easily reduced; on the other hand, sulfur addition can adsorption of the surface of the BiOCl nanoparticles and make it easier to be reduced. As a result, BiS0.5/AC possesses a relative higher catalytic activity. X-ray photoelectron spectroscopy (XPS) was used to determine the electronic property of surface chemical compositions of the fresh and used catalysts. Fig. 3 displays the Bi 4f regions of XPS spectra of the Bi/AC and BiS0.5/AC catalysts. To detect any shift more precisely, the positions of Bi 4f peaks were referred to the main peak of C 1s (284.6 eV). 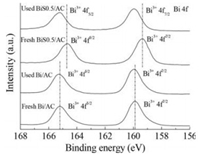 Comparison between the spectra of two fresh catalysts Bi/AC and BiS0.5/AC (Table S1 in Supporting information) indicated that the binding energy for the Bi 4f peak of fresh BiS0.5/AC is shifted negatively ca. 0.5 eV relative to the energy observed for the freshly Bi/AC catalyst. 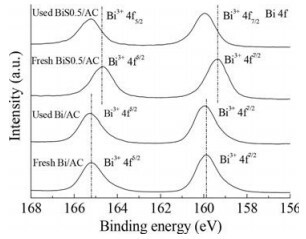 This negative shift in the Bi 4f binding energy of BiS0.5/AC catalyst is due to the decreasing in the size of the active component and the attachment of the sulfur species onto the BiOCl surface . Therefore, the active site increasing in the BiS0.5/AC catalyst leads to the promotion in the catalytic performance. Besides, the positive shift of Bi 4f binding energy for the used catalysts reveals the growth of the BiOCl during the running time, resulting in the decreasing of the catalytic performance for acetylene hydrochlorination reaction. In Fig. S4 (Supporting information), the binding energy of the sulfur species was found to be 168.7 eV, demonstrating the presence of SO42- in the catalyst [22, 23]. Fig. 3. Bi 4f XPS spectra in fresh and used Bi/AC and BiS0.5/AC. To explore the reason for the enhanced catalytic performance of S-promoted Bi/AC catalyst, low-temperature N2 adsorption/desorption experiments were performed to investigate the textural properties of the Bi-based catalysts with the addition of H2SO4. Table 1 listed the specific surface area, pore volume of the fresh and used Bi/AC and BiSX/AC catalysts. Compared with Bi/AC, these BiS0.1/AC, BiS0.5/AC and BiS1/AC catalyst have a larger Brunauer-Emmett-Teller (BET) surface area and this value decreased with the enhancement of H2SO4 doping. The rising of the specific surface area is probably due to the hindered crystal growth of bismuth oxychloride by sulfur doping, consistent with the XRD and H2-TPR results. In addition, the specific surface area and total pore volume of the spent catalysts are lower than those of fresh catalysts, indicating the coke deposition formation or BiOCl particle sintering occurred during the reaction time, which usually caused the deactivation of catalyst [7, 24]. Porous structure parameters of catalyst. Thermogravimetric analysis (TGA) was performed to provide direct evidence to the coke deposition formation, which usually caused deactivation of catalysts [25, 26]. Experiment was operated under an air atmosphere and the results are illustrated in Fig. S5 (Supporting information). The quantity of carbon deposits should identical to the difference in mass loss between the fresh and used catalysts within the temperature range of coke burning. The weight losses of fresh and spent Bi/AC catalysts in the range of 150–350 ℃ are 3.8% and 4.8%, respectively, which suggested that the actual amount of coke deposition is 1%. The actual quantity of coke deposition by the BiS0.5/AC is 1.6%, which is higher than that deposited on the Bi/AC catalyst. Therefore, the coke deposited on the BiS0.5/AC catalyst occurs to a greater extent than that by the Bi/ AC catalyst, consistent with the XRD results. Thus, the enhanced stability of BiS0.5/AC catalyst cannot be attributed to the coke effect of the catalyst . 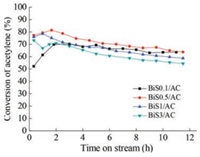 Overall, BiSX/C catalysts with different Bi/S molar ratios were synthesized and BiS0.5/C exhibited better catalytic performance than Bi/C catalyst for the acetylene hydrochlorination reaction. The enhanced catalytic performance was mainly attributed to the better dispersion of the BiOCl particles and elevating of the specific surface area of the catalysts, which consequently led the BiS0.5/AC catalyst with increased amount of accessible active sites. Therefore, the introduction of promoter was demonstrated as an effective method to improve the catalytic performance of the nonmercuric non-noble catalysts for acetylene hydrochlorination reaction. This work was supported by the National Natural Science Foundation of China (Nos. U1403293, 21263025) and the Graduate Research and Innovation Program of Xinjiang (No. XJGRI2015010). Supplementary data associated with this article can be found, in the online version, at https://doi.org/10.1016/j.cclet.2017.12.017.